Continually on edge about what action the Federal Reserve ("The Fed") will take to at its next policy meeting, or how the endless public statements by Fed officials affect markets? Here I offer salient predictions and commentary, along with links to key Fed data and statements. 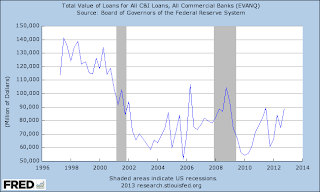 Condition Statement of Federal Reserve Banks. This is essentially a shortened version of the Fed's balance sheet, and one of the more important data releases to track. A handy Java tool for showing recent Fed balance sheet trends, including credit and liquidity programs, can be found HERE. • Fed/Central Bank Liquidity Swaps: Location of announcements for major currency/liquidity swap programs. These swaps affect global markets, as do monetary policy changes or quantitative easing programs. • NY Fed Statements & Operating Policies: Location of official statements on major monetary policy or monetary liquidity programs. Convenient place to revisit if you've forgotten the Fed's positions on specific asset purchase or loan programs. • NY Fed Permanent Open Market Operations: Location of all POMO transactions (as publicly reported). • NY Fed System Open Market Holdings: The SOMA holdings are a quick summary of accumulated POMO transactions to the Fed balance sheet. • NY Fed Primary Dealer Statistics: Key for tracking the repurchase agreement ("repo") markets that the Fed has made so lucrative to Primary Dealers looking for a spread trade (search financing: repo/reverse repo). • Modeled after the Bank of England and the First National Bank of the United States. The Fed is not an independent body, but a government-sponsored entity. An enlightening history can be found HERE, and then HERE. Last June, I equated the possibility of the Fed increasing its MBS purchases substantially beyond its already steady, continual purchases as a lack of confidence in the secondary market to absorb MBS supply, and a scheme to keep mortgage rates artificially low. 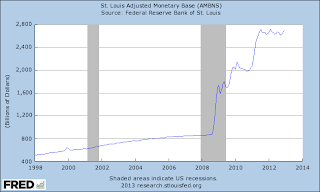 Since then, the Fed has announced “QE3,” or what some have called “QE-infinity,” since the defined asset purchases may go beyond $40B a month additional MBS purchases to include outright Treasuries or other assets – in short, “open ended.” With the government guaranteeing the majority of mortgages issued in this country, we’ve come full-tilt toward nationalization of the mortgage markets, and the moral hazards that accompany those guarantees. The Fed has become a major buyer of government guaranteed MBS issuance, and a partner with the government to provide the politically lucrative environment of cheap money and low rates for mortgages. In the past six months Fannie and Freddie (80% owned by the Treasury from a 2008 conservatorship bailout) have reported record losses, and the FHA has warned that it will require a bailout from the Treasury. The alternates, to allow housing/mortgage markets to clear without backstops and mortgage rates freed to find price discovery, have been all but abandoned. This has had the consequence of a market plagued by a slow recovery, and with the Fed throttling the markets with cheap money and rates, the beneficiaries have largely been investment banks and asset managers buying up real estate assets for rental properties and REIT creation. I need not remind the reader what another mania in securitized real estate assets means to market stability. Minsky would be crying “Ponzi Finance,” as am I. Never mind that to make all this happen, debt-free creditors and savers are forced to give up income, and may even be flushed out of money funds to boot. As expected, the Fed threw more salt on an open wound when it announced plans on December 12, 2012 to end Operation Twist, but begin outright purchases of Treasuries at a clip of $45B+ a month, bringing the total money supply infusion from asset purchases to $1T+ over 2013. Additionally, it stated that it was tying its zero interest rate monetary policy (ZIRP) to employment and inflation targets, despite the lack of evidence that such monetary policies positively affect growth leading to an improvement in employment, and clear evidence that such policies lead to asset price inflation and misallocation of resources to unproductive means, that is, leading to losses and further stagnant growth. The Fed and FOMC as a central planner is a hazard to the health of organic recovery, and moreover, a destabilizer of markets, should interest rates dislocate higher despite the Fed’s measures. 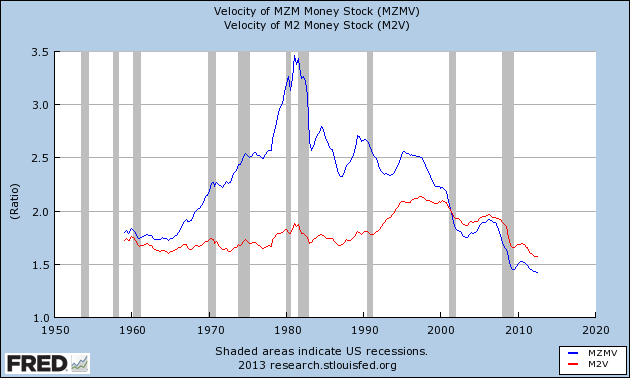 Readers should note two key Fed-published metrics: the adjusted monetary base (AMB), which is defined as the sum of reserve accounts of financial institutions at Federal Reserve Banks and currency in circulation (i.e., currency held by the public and in the vaults of depository institutions), and the velocity of money stock (VoM), be it M1, M2 or MZM. The AMB has increased 300% since fall 2008, the largest increase in dollar terms in history, while the VoM has continued to decrease. The standard litany is that inflation will not increase substantially while the VoM is falling and not increasing, and especially while all that injected liquidity in the AMB is sitting in reserve banks. This is false. The money was injected to shore up bank balance sheets, and it allows banks to act as counterparties in Treasury and Agency/MBS securities transactions. 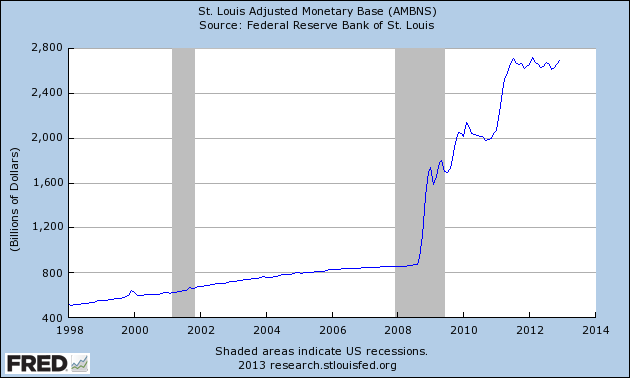 Banks use this money (and the interest they make) to trade and drive up asset prices. 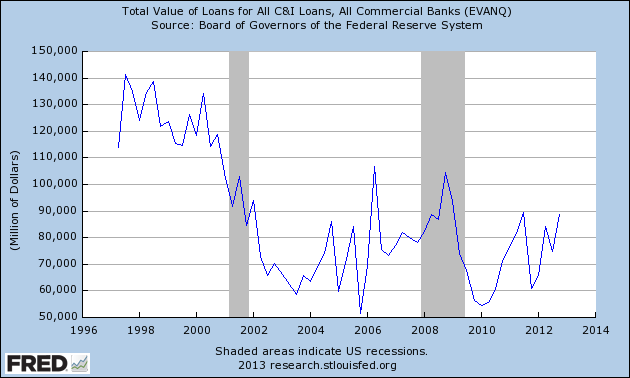 Commercial and industrial loans are up on a relative basis, since bottoming out in early 2010. Consumer credit has sprung to new highs, following an interim bottom in 2010/11. 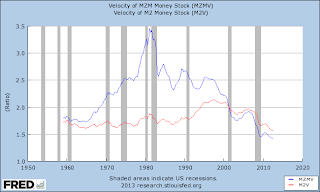 So why did the Fed find it necessary to release all that liquidity? The reason is simple, yet alarming. The Fed cannot sustain low borrowing rates for its prime customer and partner, the government, without significant asset purchases to do so. The Fed buys some 80%+ of the Treasury issuances. A failed auction is not an option. The same can be said of the mortgage markets, now that the government guarantees the majority of mortgages. What have we gotten ourselves into? Cut the powers of the Fed before it is too late. Take the pain of the consequences now, and return to market capitalism, not a sentence of market socialism, or worse, crony socialism. Force Congress to pass budgets that get us on a path to real solvency and not a drag on real growth. Obviously the Fed has failed to provide a check to profligate spending, given that it aids and abets Treasury borrowing. This has put our entire financial system at risk of a severe interest rate dislocation, out of control of the Fed. 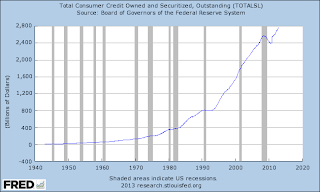 When will the Fed pull the foot off the accelerator of the AMB, and when will it start to shrink its balance sheet, putting purchased debt back on the market? I don’t think this will ever happen. The Fed is where bonds go to die. The Fed cannot sell off any appreciable supply without a market to absorb it, and it is slowly destroying any real markets. Investors in the main demand trust, and that trust is eroding from the actions of the Fed. QE-infinity is QE-insanity. A company cannot issue equity and debt “open-ended” without suffering the consequences of the markets, and neither can the Treasury/Agency/Fed triad. I have predicted that the Fed will likely engage in another coordinated swap with the Eurozone, and may extend Operation Twist. Continued purchases of MBSs is supposedly already priced in, as the Fed, via its NY Fed statements, has made it clear for some time that these purchases will continue at discretion. Several pundits are claiming that the Fed will not continue Twist, as it will mean the Fed will end up with an oversupply of longer duration Treasuries on its balance sheet, some 40% vs. 30% after the end of Twist'11 in June. Keeping government and agency debt financing costs low may require an extension anyway, and may be executed with a different mix of maturity extensions (the original program announcement is HERE). In general, I've argued that the longer the Fed hedges to keep rates low, the greater the "latent" interest rate risk grows on these debt instruments, which are increasingly woven into the financial fabric, in particular as key collateral (along with Agency debt) for funding/financing markets (e.g. repo, etc.). Fed officials must be aware of systemic risks they themselves create. Now that the 10-year Treasury has traded with a yield below 1.5%, where is the new low target? Let's make that 1%. As for purchases of mortgage backed securities (MBSs), some, including the popular media, are claiming that any purchases going forward would be new quantitative easing (QE). This is not correct. The Fed is already on record (and has been for awhile via its NYFed statement) as committed to continual purchases of MBSs. This is theoretically already priced in, unless the markets have completely forgotten this fact. Of course, a major jump in MBS purchases would represent a change, and indicate that the Fed has a weak view of the secondary market for these MBSs. Such a move could be counter-productive to markets that are trying to absorb MBS supply, and further throttle "moral hazard." So what else will there be? If the Fed engages in an all-out "QE3" of major additional outright purchases of debt, or even repos and loan programs (cf. the line items on the Fed's H.4.1 release), this stimulation has been shown to inflate asset prices artificially without much stamina, and adds to price uncertainty. We need to get back to fundamentals and healthy business cycles. The Fed cannot continually cover up for poor fiscal and regulatory policies, and the gyration(s) in asset prices is counter-productive. May 2012: I predicted that the Fed would engage in another coordinated swap with the Eurozone, similar to those conducted in Fall 2011. Likely timing on this is after the first or second week of June. April 2012: I predicted that the 10-year Treasury would hit a low yield of 1.5%. This would represent a new historic low, after reaching 1.67% in September 2011.